Movie Review: #TheBelkoExperiment Welcome to @JamesGunn gore-fest! - sandwichjohnfilms Movie Review: #TheBelkoExperiment Welcome to @JamesGunn gore-fest! Movie Review: #TheBelkoExperiment Welcome to @JamesGunn gore-fest! Welcome to James Gunn's gore-fest! 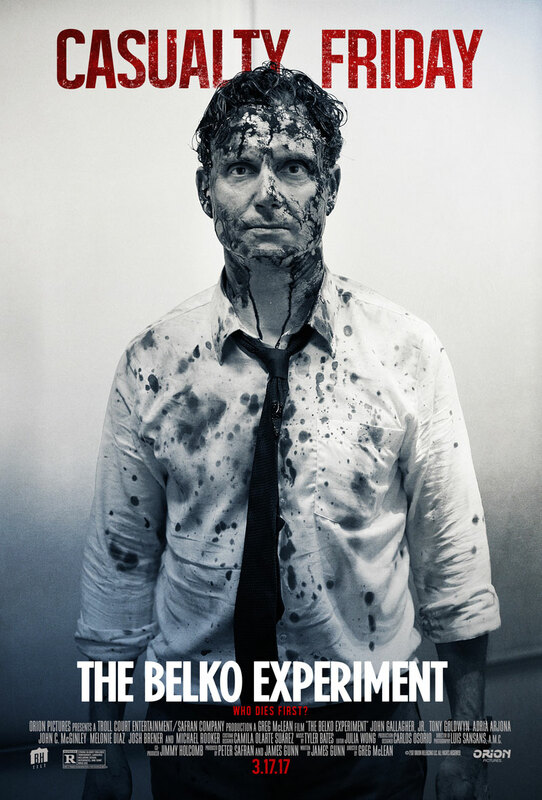 Will “The Belko Experiment” do to office setting workplace what “Jaws” did to swimming in the ocean? All joking aside, this R-rated gore-fest by James Gunn goes to prove that inside the mind of that dude who gave us Marvel’s “Guardians Of The Galaxy” is actually a hidden secret door that when you open it leads to all kinds of twisted imaginations. “The Belko Experiment” is gnarly. Directed by Greg McLean, scripted by James Gunn, the story focuses on about 80 Americans working in an non-profit corporate workplace in South America and they find themselves locked in their own building. An unknown voice form the intercom system forces them to engage in a deadly game of kill or be killed. Yes, you can describe it just as that one critic says that this is basically “Battle Royale” meets “Office Space,” it certainly throws “The Hunger Games” out the window. So essentially, the concept itself is not unique, I guess there’s a sick part of us that wants to watch what humans will do to each other if their survival depends on it, the same sick reason why ancient Romans loved watching gladiators fight. This is not the smartest plot that James Gunn has ever concocted but it’s his attempt on tackling psychological and social studies from his own perspective. As a horror thriller, “The Belko Experiment” is choppy and all over the place. It fails to make the office play some kind of a supporting role. And the characters’ weapons, which are basically whatever they could get their hands on, makes it hard for us to take them seriously. The film puts more emphasis on coming up with the most ridiculous ways to die as opposed to building up the suspense. Yes, it begs you to ask what would you do if you were in their situation, but halfway through you couldn’t care less about that anymore and you just want to see them annihilate each other, like an unfiltered deathmatch.